In the last decade, I’ve led dozens of tour groups on my Disneyland tour of downtown Los Angeles. We explore the heart and soul of the city as if it’s everybody’s favorite theme park. “Fantasyland” is the Bob Baker Marionette Theater. It’s a palace of puppetry, a museum of marionettes, and a castle of creativity. Up until about six months ago, Bob Baker—who’s 90—performed his signature act for my tour groups. It featured a special marionette he made in 1939 of tap dancer Bill Robinson. Since 1961, people have been coming to the theater on the outskirts of downtown L.A. to be entertained by Bob Baker’s one-of-a-kind marionettes. Sometimes they visited as children and then return as adults with their kids or even grandkids. Since 1961, people have been coming to the theater on the outskirts of downtown L.A. to be entertained by Bob Baker’s one-of-a-kind marionettes. When a fund was set up recently to raise money for Bob Baker’s in-home hospice care, there was an outpouring of love for him and comments about the joy and magic he brought to so many people. When I first visited the Bob Baker Marionette Theater in 1999, I was completely swept away by everything about the place. The building doesn’t look like much from the outside as you pass it on Glendale Boulevard. The years have unraveled some of its original whimsy. But once you step inside, you enter a time warp. The theater is so honest and unpretentious. On my first visit I noticed the beautiful and well-worn red velvet curtain and the handmade decorations hanging next to light fixtures made from coffee cans. Then the show began and I was even more awestruck by the marionettes themselves. They had so much character and were so beautifully dressed. Watching them move across the stage right in front of me, they almost seemed like they were alive. Each one is a work of art and has been performing for decades. When I finally had the privilege to meet Bob, I had so many questions and he was happy to answer them. I was so impressed by his photographic memory of growing up in Midtown Los Angeles. This is a man who found his life’s work at age 6 and began performing professionally at 8! He told me his first puppet came from Bullocks Wilshire, where he learned puppeteering from the woman who ran the puppet department. By the time he was 19 in 1943, he was manufacturing and selling his marionettes to the finest toy stores in the United States. Not only is Bob a master puppeteer—he is a master puppet maker. One of his experienced puppeteers once told me that working a Bob Baker marionette must be what it feels like to play a Stradivarius, referring to their craftsmanship and how well they move. Bob Baker’s marionettes were even sold on Main Street USA at Disneyland. Bob told me he made a handshake deal with Walt Disney in 1955 to produce a line of Disney character marionettes. Up until about 10 years ago, you could buy a Bob Baker original at the theme park. His marionettes also appeared in many television shows, from Bewitched to Star Trek, and movies, from GI Blues with Elvis Presley to A Star is Born with Judy Garland. In the early part of his career, he provided entertainment for children’s parties at the homes of Hollywood stars like Lucille Ball, Joan Crawford, and Ronald Reagan. Once I got to know Bob, I asked if we could put on a big retrospective show. My goal was to feature more of his puppets than any show he’d ever created. In 2005, we produced Bob Baker This is Your Life. I presented film clips and slides that told the story of Bob’s life and theater. The puppet show was an extravaganza and featured more than 200 marionettes, including many of my favorites: the flying purple people eater; the fly-apart, glow-in-the-dark skeletons; the dancing dodo birds dressed as 1920s flappers; and the enormous ostrich that lays an egg, which hatches a baby bird that stumbles across the stage. Just like every show at Bob’s theater, the performance was followed by cake and ice cream in the colorful party room. Bob’s work has touched so many lives. Since he opened the theater in 1961 with his late business partner Alton Wood, there has been a performance almost every day. He and his troupe of puppeteers have also performed at countless fairs, festivals, pageants, parades, and parties. 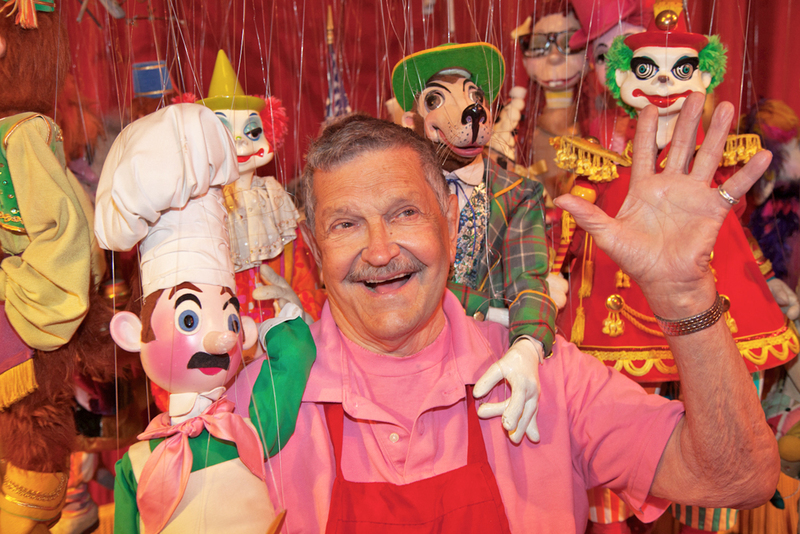 The Bob Baker Marionette Theater has survived against all odds for more than 50 years. But nothing lasts forever. A developer who purchased the theater last year is now threatening to build an apartment complex on the site. But for now, and for as long as I can, I will continue to thrill my tour groups by bringing them to the Fantasyland that is Bob Baker’s Marionette Theater. Charles Phoenix is a performer and author celebrating classic and kitschy American life and style. He’s also a field tripper, food crafter, and found photo collector. Primary Editor: Becca MacLaren. Secondary Editor: Joe Mathews. *Photo courtesy of Sean Teegarden. arts, Disney, L.A. history, performing arts, theater, Thinking L.A.